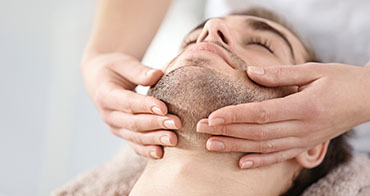 We offer a range of male grooming treatments that will help you look and feel your very best. Today, men are taking more care of themselves than ever and are interested in a wide variety of treatments from waxing all the way through to facials, pedicures and manicures. We help our male clients with advice on a skin care regime that includes products that will keep you looking younger and fresher. The benefits are that you will look great and feel more confident which is a real boost for the business professionals and the health and fitness conscious men. Using a tea tree wax to help with sensitive skin. We wax the whole back with a warm wax that includes the shoulders, the neck and the top part of the upper arms. The price varies upon the amount of hair. The price will vary according to the area waxed. Shaping and removing excess hair from the brow area (including removing the mono brow). Cutting and filing nails. Cuticle care and removing rough skin. Nails and cuticles are expertly groomed to leave a neat and tidy finish, followed by an invigorating hand scrub that leaves skin looking and feeling much more softer and smoother. The nail treatment is then finished off with a relaxing hand massage. Nails and cuticles are expertly groomed to leave a neat and tidy finish, the feet are filed removing any excess hard dry skin, this is then followed by an invigorating foot scrub that leaves skin looking and feeling much more softer and smoother. The nail treatment is then finished off with a relaxing foot massage. A warm therapeutic paraffin wax is applied to the hands to moisturise and soothe dry sore skin. The treatment is highly recommended not only for dry skin sufferers but also relaxes muscles by relieving joint pain and stiffness whilst improving the blood flow. Includes all details of male manicure services. A warm therapeutic paraffin wax is applied to the feet to moisturise and soothe dry sore skin. The treatment is highly recommended not only for dry skin sufferers but also relaxes muscles by relieving joint pain and stiffness whilst improving the blood flow. Includes all details of male pedicure services. Yes! Men want to look and feel their best about their bodies especially if they have invested in them at the gym for months so why not! and whether it’s to help feel more confident or bare all to reveal a more groomed look this is a preferred look most men are edging towards. This is also a popular choice for sticky hot summer months too. What kind of men get beauty treatments? All men need pampering, not just for the likes of celebrities such as David Beckham and Tom Cruise! So, it’s no surprise that more and men are going out of their ways to look dapper, is it?